On Sunday night I may have accidentally crashed a child’s birthday party. I think her dad’s name is Mike. I never met him, or her. We were on Lantau, which is another tropical island nearby, staying with our friend, and had gone down to the beach to join Lantern Festival barbecues. There were many barbecues going on, one of which we were supposedly attending. The friends of friends were at two different ones, and we found ourselves at a party near some children. Cupcakes and glow sticks abounded. We were at the party for the children. We knew a few people at the event, albeit not very well. I was given a “weapon” of a foam ensconced glow stick, flashing green, red and blue, and we started chatting to some acquaintances. They went off to get some beer, and we were left stranded with a glowing light, at a child’s birthday party. Consequently, we waxed anti-social and wandered off to the waterfront where the moon was full and orange. We came back to find our original host, who informed us that the real barbecue was off that way. We arrived with stolen cupcakes, wine and a glow stick to find meat grilling hot and people we had actually conversed with at a prior time. 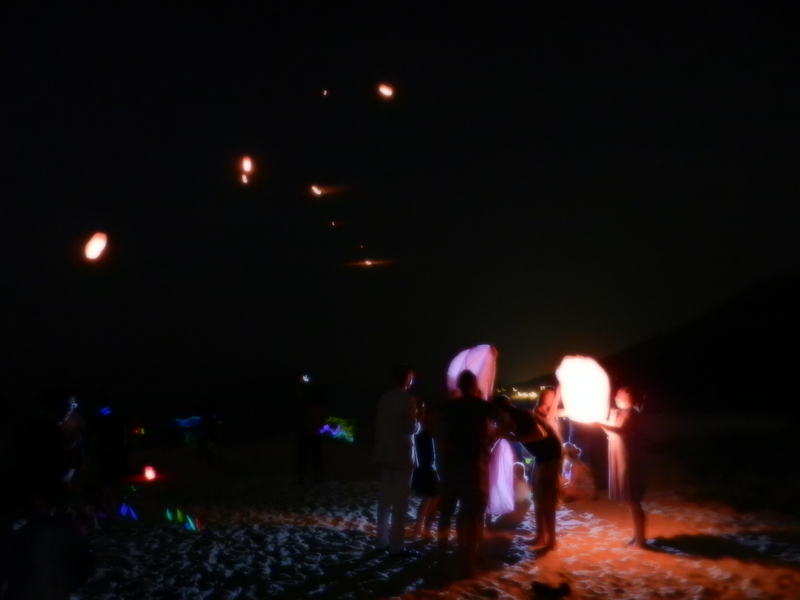 It was after some revelry that people started setting off the lanterns. The traditional lanterns are made of paper, usually red, and lit with a candle or coal of some kind, such that they act as a hot air balloon and fly off into the night sky, bearing the hopes and dreams of their originating owner. Now, this activity is not entirely approved by the law, what with the flammability. Legality notwithstanding, it is an absolutely superb event. One holds a lantern while lit, until it is full of hot air, then toss it lightly into the air. The lanterns go up in waves and fill the sky, next to the orange full moon. Sometimes they begin to burn through the paper and fall flaming into the ocean, but mostly they drift off into the night. Extraordinary.